Ink and Steel is not so much a prequel to Blood and Iron as it is a novel which just happens to be set in the same world and shares a handful of the same characters of Blood and Iron. Set some four hundred years before Blood and Iron, Ink and Steel takes the reader away from modern day New York City and brings the reader to Elizabethan England. Elizabeth Bear takes her readers to the days of Queen Elizabeth, of dissent, of theatre being dangerous, of ideas being dangerous, of intrigue, of storytellers, of murder, of faerie tales being real, of poets and playwrights. "All stories are true," Elizabeth Bear tells us. This simple statement is repeated on her website, in Ink and Steel, in Whiskey and Water, and very likely in the first Promethean Age novel Blood and Iron. All stories are true. This may have multiple meanings, and as the series progresses, very likely will, but what may be the primary meaning in The Promethean Age is that the stories people tell have the power to shape reality. The stories become true. With storytellers as the protagonists of the novel, this idea pervades Ink and Steel. Despite being pronounced dead in the very first sentence of the novel, one of the two protagonists of Ink and Steel is Kit Marley, also known as Christopher Marlowe. Yes, this is the Marlowe of Faustus, the poet and playwright. Among many other things, Ink and Steel is a novel of ideas, of poetry and theatre, and this is made evident by Bear's choice of dual protagonists. Kit Marley is one. The other is Will Shakespeare. Yes, that William Shakespeare. The chapters alternate between Kit and Will and are written in a very tight and limited third person perspective. The reader experiences the story through the eyes and thoughts of Kit and Will. Anything they are not aware of us left unseen by the reader. This allows for readers to delve deeper into the characters of Kit Marley and Will Shakespeare and provides a more emotional reading experience. More than anything, more than even the "story" Elizabeth Bear is telling, the characters of Ink and Steel matter and carry the novel. Right. Right. What about the issue of Kit Marley dying in the very first line of the novel? This is where the fun starts. Kit Marley is whisked away by the Fae, healed, and made to turn his allegiance from Queen Elizabeth and serve Queen Mabd, the Faerie Queen. Meanwhile, taking Marley's place in service to Elizabeth is Will Shakespeare. See, there is magic in poetry and there is magic in theatre, magic that can prop up monarchs. Both Elizabeth and Mabd seek to use this magic to strengthen their respective reigns and protect their realms from those enemies which would seek to usurp their power, whether the foes are external or internal. In Faerie various factions strive to turn Marley's magic for their own gains. In England, Will learns of the strife within the Prometheus Club and the antagonism of those who oppose Elizabeth. Will playwriting must provide the magic Marley wrote into his plays, but the act of doing so will put his life in jeopardy from those who killed Marley. It is the magic Marley and Shakespeare create with their words which thrusts them into the intrigue of nations in which anyone may be discarded so long as the monarchy is preserved. Yet, Ink and Steel is not a novel about magic, unless it is the magic of storytelling. 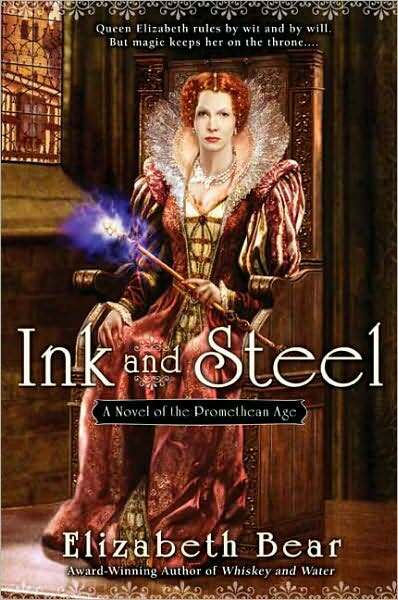 The heart of Ink and Steel is the characters Elizabeth Bear plucked out of history and brought to life so clearly on the page. Kit Marley and Will Shakespeare are fully drawn, three dimensional characters inhabiting an Elizabethan England which lives, breathes, and even smells a bit. Not just the protagonists, but all characters in the novel true characters and not just constructs or devices to fill a role in the plotline. These characters have their own motivations and when they are not a part of the action of the novel the reader is left with the sneaking suspicion that the characters are off doing their own thing and having their own troubles and triumphs. They do not sit idly by waiting for Bear to call on them. The storytelling lives through the characters, from Marley to Morgan, Shakespeare to Puck, and Elizabeth to Lucifer. To name six. The story happens because of the characters and because of Elizabeth Bear's gift for bringing them to life and also because Bear does not betray her characters by backing off from allowing very bad things to occur if demanded by the story. Bear is true to the characters and true to the story and Ink and Steel is a stronger novel for it. At this point it would be appropriate to mention that Ink and Steel is really only half of a novel. Oh, it has a definite beginning, middle, and end, but Ink and Steel was originally part of a larger novel titled The Stratford Man. The Stratford Man was written with a theatrical five act structure, which may give hints to astute readers who can work out how that structure works and what it means for story. Ink and Steel contains the first three acts and while it is a fully satisfying novel in its own right, Ink and Steel will only be complete when read in conjunction with the final two acts of Hell and Earth. All stories are true. Elizabeth Bear has fashioned this four word statement into a driving force behind her Promethean Age novels. The stories told by major historical storytellers have the power to shape reality, both in how the magic of their storytelling may strengthen their political causes and also, in the case of Faerie, directly influence what is real. There are many stories of Arthur, Morgan, and Lancelot, of Satan, of Faerie, and they are all true. They all melt into each other and as stories are told, the melting does not stop. This is not the only meaning of "All stories are true," however. Elizabeth Bear's talent is such that her fictional creation, her story is so well written that a reader could swear that this isn't just a collection of well written lies, but that it was history. That these are the untold stories of Marlowe and Shakespeare, that Faerie is a real and dangerous place, that King Arthur still sleeps until the moment he is most needed. Elizabeth Bear makes the reader believe that yes, these stories are true. This is the beauty of Ink and Steel. "The Girl Who Sang Rose Madder"
Anyways, until the next time I run across your page, c ya' ciao! wow really nice informations thank you man I have bookmarked your blog it is very informative blog. Highly recommended for anyone who has enjoyed Mary Gentle's alternate worlds of Ash, or the harder works of Ursula Le Guin, as well as the wonderful world of Neal Stephenson's baroque trilogy.